Edward S. Curtis’ The North American Indian (1907-1930) was an ambitious project. Curtis set out to document North American indigenous peoples, capturing their lives through both photographs and narratives. This work is not without its critics in the modern era and Curtis himself is a complicated historic figure. That said, the plate volumes are filled with stunning images and are beautifully printed. Our edition has 20 volumes of folio plates, each with an average of 36 individual plates. 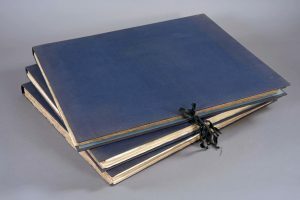 These are housed in portfolio-folders that are tied at the foredge. A very thin piece of tissue is in between each plate. These portfolios do not provide adequate protection from abrasion, dust, light, and heavy use. It is also very difficult to find an image within the stack of plates when a patron requests one. Tedd is back and building boxes! After discussion with the curators we decided we to build custom enclosures for the plate volumes . 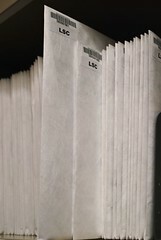 Each plate will be housed in a paper folder, and each volume would receive a custom cloth drop-spine box with a label clearly indicating the contents. 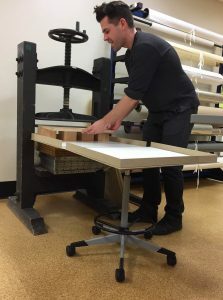 This solution will provide the most protection for the plates, and will make finding a plate easy when it is needed for a class or for a patron. 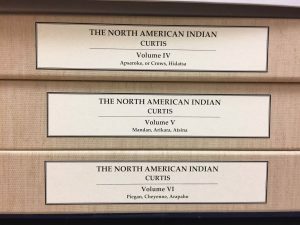 The custom enclosures for “The North American Indian” plate volumes was generously supported by Jan Tore Hall (T’73) through the DUL Adopt-a-Book program. His donation was made in memory of Inger Tavernise, with thanks for the shared times in service to the University through its Library. 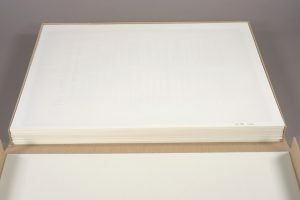 Mr. Hall’s donation allowed us to purchase custom folders for the prints, and bookcloth and binders board for the boxes. Rachel re-foldered and labeled each print to prepare them for boxing. We brought back Tedd Anderson to make the 20 oversized custom boxes. 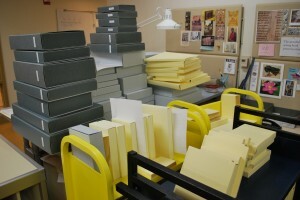 As readers may remember, Tedd worked in the lab for many years creating extreme enclosures for all kinds of books. We knew he could make these large boxes efficiently and beautifully. The first set is finished and labeled and ready for the shelf. Here are some action shots of the boxes in production. Pressing edges using the “Duke Stool Support System (TM)” (aka the stool no one likes to sit on but is a great extension for the floor press). That stool has found its true calling. The new labels tell you what is in the box, a huge improvement over the old enclosures. And here is the before and after reveal. (top) Original portfolio and (bottom) new custom box. Individual folders for plates inside custom box. 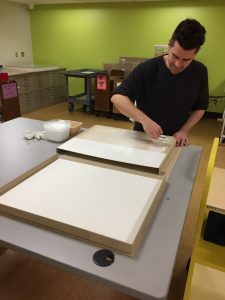 This month on the 1091 Project we are highlighting the non-book, non-paper items that come to the conservation lab for evaluation and rehousing. 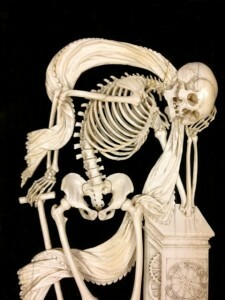 In our collections we have the usual amounts of prints, drawings, paintings and various other kinds of artwork. But we also have hanks of famous-people’s hair, pink felt dragons, christening gowns, weather vanes, plaster death masks, roll-playing figurines, shaving mugs, poison arrows…you name it, we likely have it. We have several items in the lab right now that fall into this category. 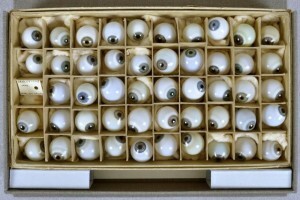 Our History of Medicine Collection provides endless challenges including these hand-blown glass eyeballs. They are so lovely and delicate, and a little creepy (the eyes seem to follow you like the Picture of Dorian Grey). Glass eyes from the History of Medicine Collection. Also from HOM is this 18th Century screw-barrel microscope in a shagreen (skate skin) case. We just started making these nifty picture-labels for objects that we put in boxes. It is a quick way to identify what should be in the box, and if the item isn’t in the box, you know what to look for. 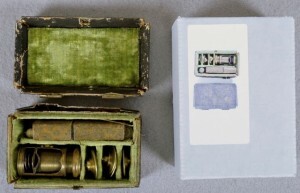 Screw barrel microscope in shagreen case from the History of Medicine Collection. HOM isn’t the only collection with fascinating non-book items. 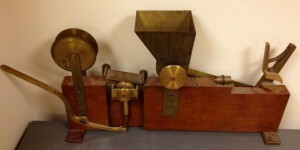 Check out this wonderful U.S. patent model of a continuous cigarette rolling machine dating from 1876. It is about two feet long and one foot high, and all the moving parts work. Continuous cigarette rolling machine patent model. If you are interested in seeing previous boxing projects, you can check out our Flickr page. 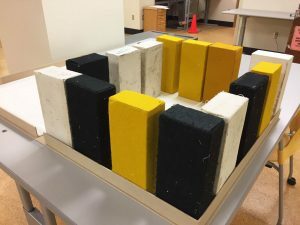 Be sure to head over to Parks Library Preservation to see what amazing things they have in their lab. This month the 1091 project is all about enclosures. Boxes. Wrappers. Tuxedos. Clams. You name it, we make it. In fact, last fiscal year we fitted or made over 8,500 enclosures. We love boxes so much we created Boxing Day, which has grown to two days a month. I’ve written before about why we create enclosures for our materials. 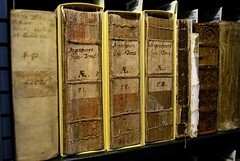 In short it is to protect books from abrasion, dust and light exposure. 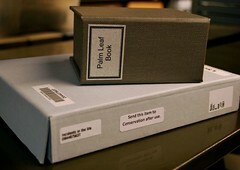 We also make boxes for artifacts from the collections so that they can safely be put onto a shelf. Most recently these have included a gravestone, death mask, and a teeny tiny Thai Village. We choose the style of enclosure based on the condition, size, and weight of the object as well as how and how often it is used. Below are the common enclosures we make, listed from the minimum to maximum amount of protection they provide. 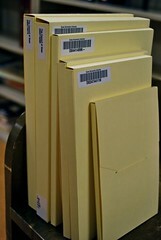 We primarily use these polyethylene book jackets for our New & Noteworthy, Duke Authors and Lilly Current Literature books. 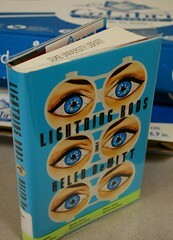 CoLibri covers make it possible to save publisher’s dust jackets, which often contain unique information such as author biographies and cover art . These take about 3-5 minutes to make. Envelopes provide a minimum of protection for fragile items such as pamphlets. They are inexpensive, easy and quick. For very thin items we will add a stiffener made of a piece of blue-corrugated board or blue-white board. If the item is very brittle, we will add a folded piece of card stock (folded at the bottom edge) to act as a sling to help get the item out safely. An envelope only takes a couple of minutes to fit and label. These are made of 10 or 20 point buffered card stock and are best for small, lightweight items that are between 1/4″ and 1″ thick. They provide protection from light and abrasion and are good for brittle materials or for books with loose boards. These take on average 10 minutes to make and these (as are the following boxes) are custom cut and folded to fit the book’s exact dimensions. Not knowing if an item is inside is a common complaint about boxing books. A good solution is this one, a variation on the traditional four flap but with a polyester spine. While they do tend to have a bit of a gap at the head and tail, they do allow you to see the contents. These boxes obviously do not provide protection from light so they are best for locations that are kept dark except when in use. These take about 10-15 minutes to make. Phase boxes, also called “button and string boxes” are perfect for items that need to be restrained to keep them flat. 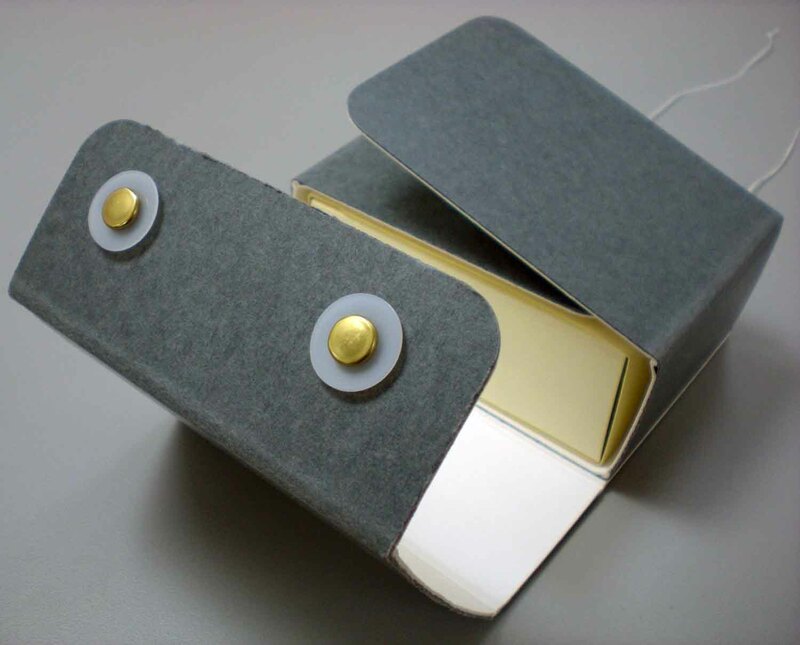 We put vellum-bound materials in these sorts of boxes to keep them from warping. These average 15 minutes to make. We make these from buffered corrugated board (also called blue clams or “pizza boxes”; bottom of photo) or we make them from binders board and cover them in book cloth (also called “cloth clam”; top of photo). These provide the most protection for the books inside. They are good for larger, heavier items and for special bindings (e.g. metal clasps, embroidered bindings, etc.). The corrugated boxes take about 15 minutes to make. 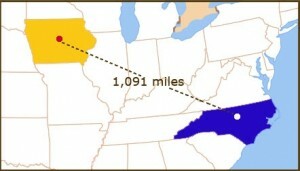 Depending on their size or complexity the cloth clams can take 90 minutes or more. Notice the “Return to Conservation after use” sticker on the blue clam. We started putting these on items that we get from Technical Services prior to shelving. This has been a very successful workflow and allows us to provide a box for newly acquired, fragile items while deferring their treatment until they are used. So far we have gotten several back. It’s nice to see patrons using new books in the collection. 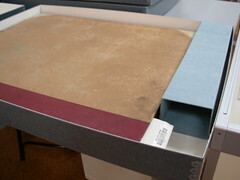 We also use a lot of pre-made boxes especially for standard sized manuscript collections or brittle, bound newspapers. Sometimes we need to customize a standard box because the item inside may be a little too small to fit exactly and we don’t want it “swimming” around in the box. 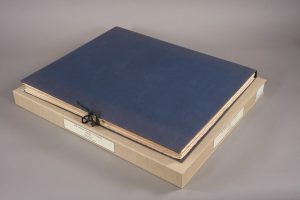 In this image, a standard box is given a custom-cut blue-corrugated board insert to keep the brittle newspaper from moving around in the box as it is transported. 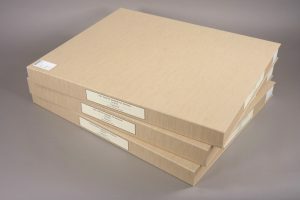 The papyri rehousing project is a good example of a hybrid project that combines commercially available boxes with custom inserts. Creating enclosures is not a one-size-fits-all endeavor. Very often you find yourself having to bring all your skills and experience to a project in order to create something to fit the project’s unique needs. You can see more interesting boxing projects on our Flickr page. 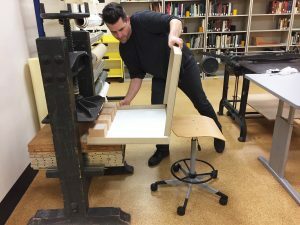 Let’s go over to Parks Library Preservation to see what kind of enclosures they create for their collections.